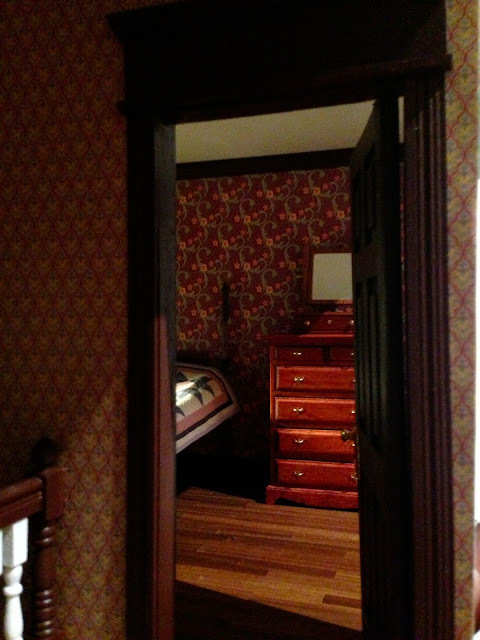 I have finally organised enough furniture to furnish the main bedroom of the American house. 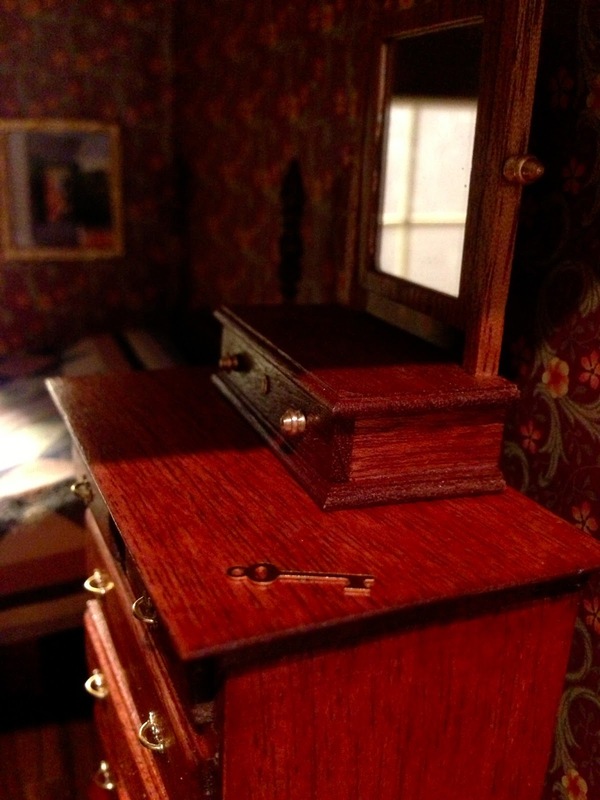 The chest is a House of Miniatures kit, the little mirror vanity on top is a McQueenie kit. They both suit the room quite well. There is a little chest (perhaps with some secret letters of jewelry) under the bed (another McQueenie kit). 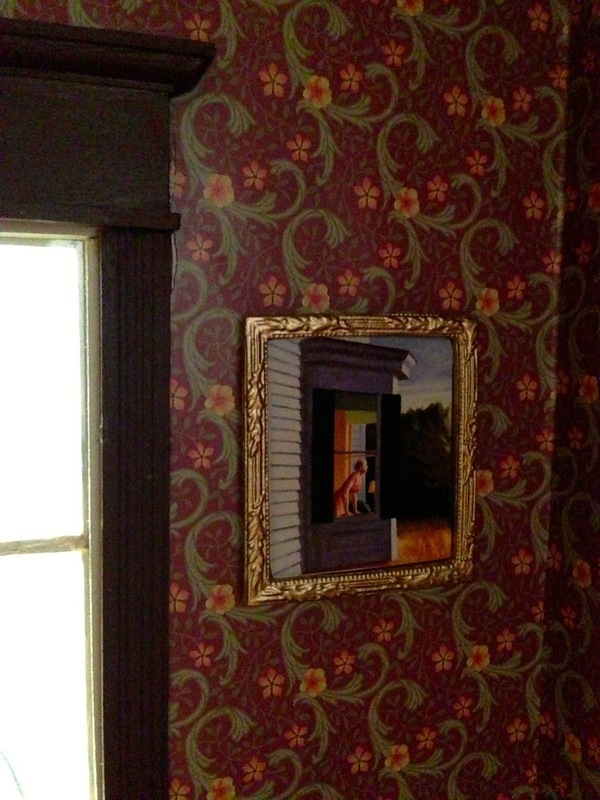 Some nice Edward Hopper paintings on the walls - a classic American artist. The key to unlock the box under the bed perhaps? Detail a beautiful hand made mahogany bed I bought from the USA. It is a lovely room. The dark colours create a most relaxing atmosphere, conducive to sleep. 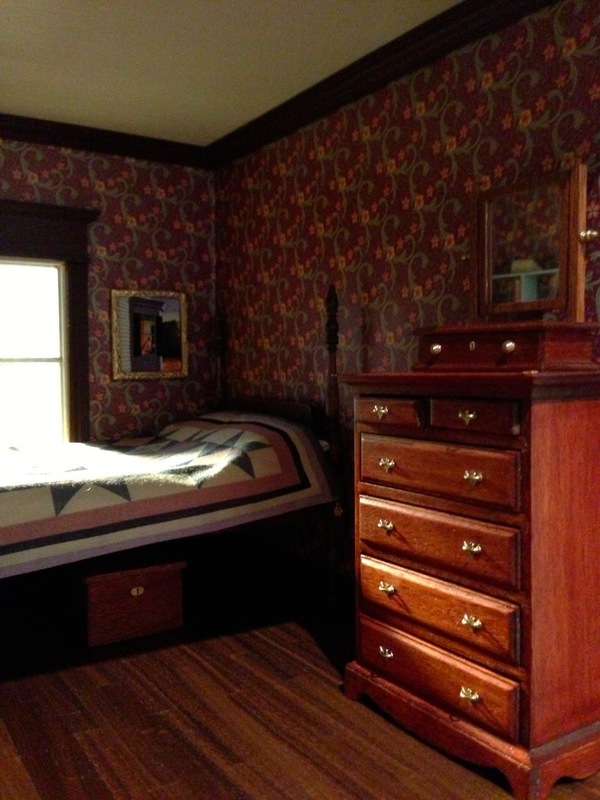 Nice touch to have that chest under the bed. 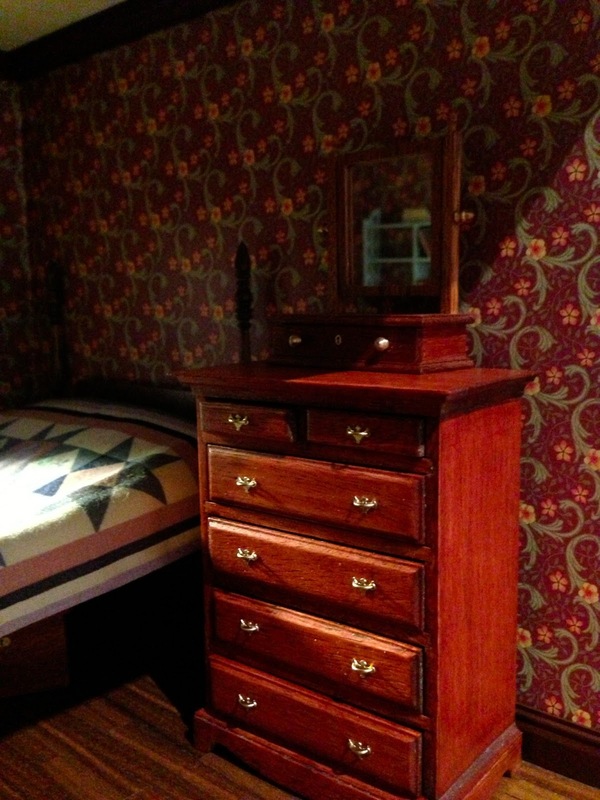 The dresser is a nice kit. Have you managed to repair all the wallpaper bubbles and just in a nutshell what method did you use? It would be helpful to know in case others encounter this problem. This is coming along beautifully and I see you managed to get your shelves to stay put! The furniture all works together very well and I'm looking forward to seeing this room developm. Thanks Irene, it was difficult to find all the little bits of furniture! I am looking for a little vase of flowers, I think that would complete the look. 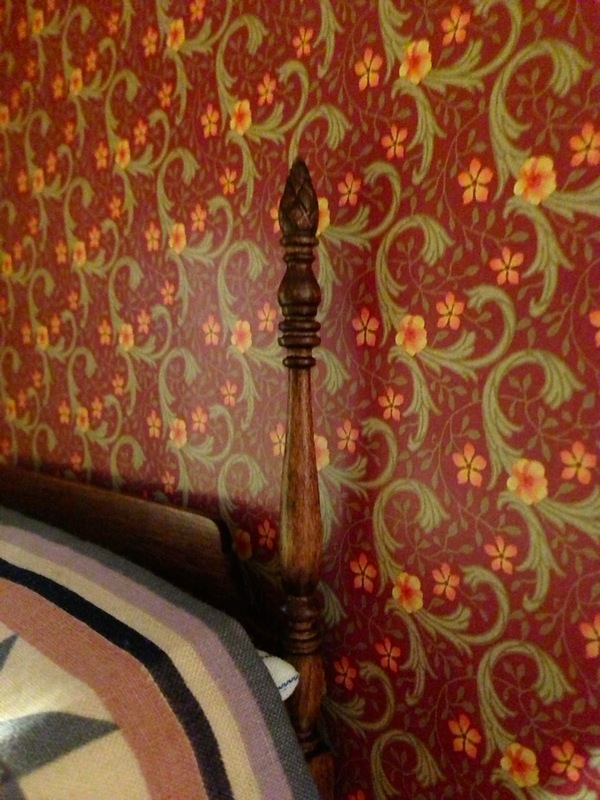 It is a charming room, such a pretty bed with the turned posts and the little box under the bed makes you look again! I am still thinking about how to repair it! 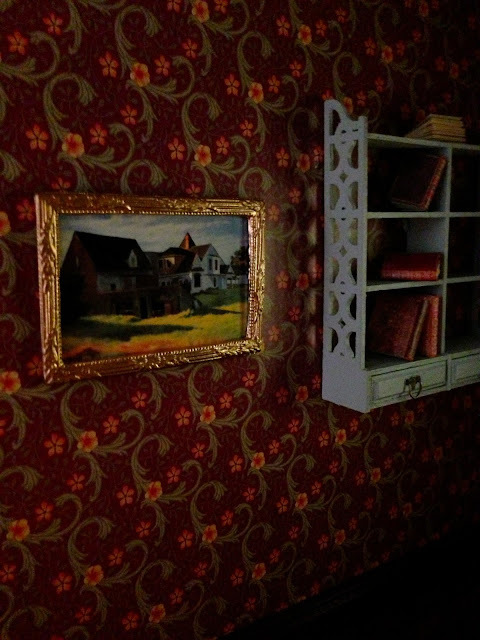 I haven't yet decided..
Beautiful furniture and the paintings by Hopper fit perfectly in the room. Thanks Liduina! Yes, I like them very much too, and I thought it would be good since it is an American house. 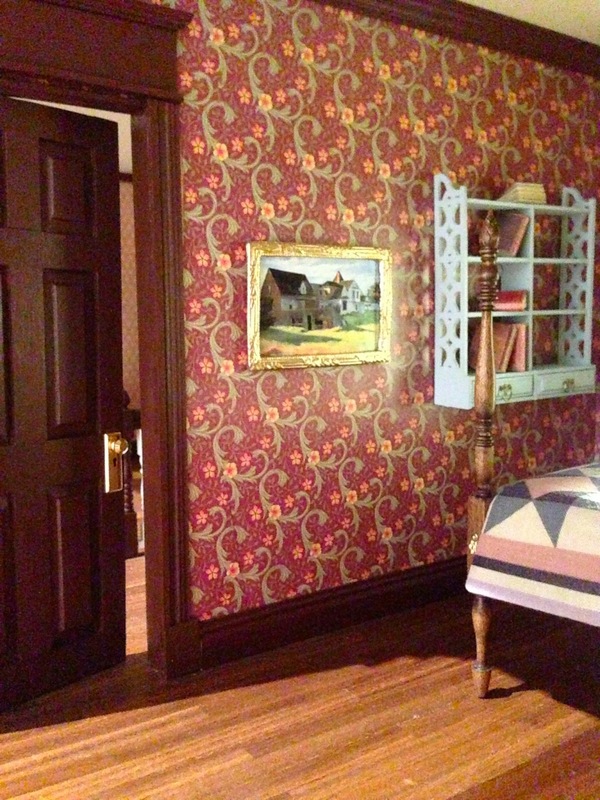 Between the beautiful woodwork, period furniture, and rich floral wallpaper, this room looks uncannily like it could be in any one of several different historic houses in my home state of California. Well done. I really like your wallpaper choice. What does that key open I wonder? This is so beautiful. Looking awesome with perfect design and arrangement. I am very much pleased with the contents you have mentioned. I wanted to thank you for this great post. I enjoyed every little bit part of it and I will be waiting for the new updates. The dark color creates a most relaxing atmosphere, conducive to sleep. 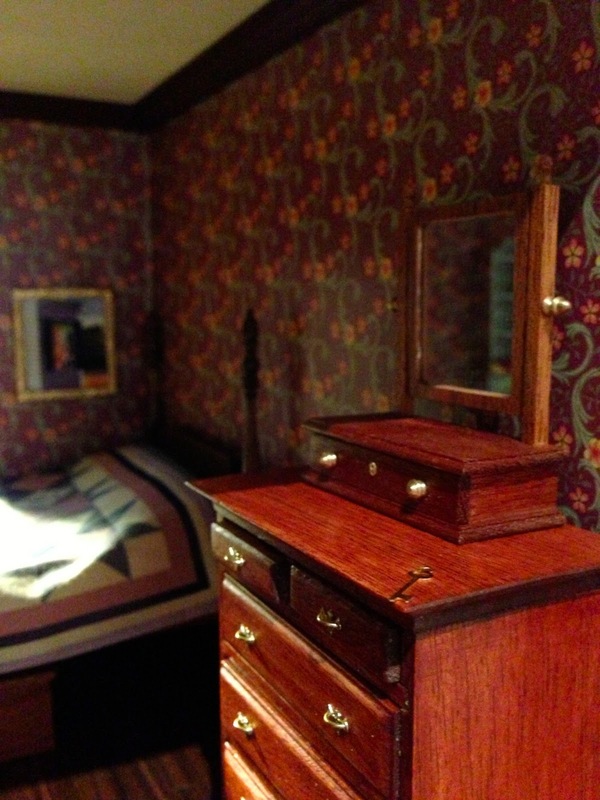 I like the 6 drawers, dressing table and on top of the table small drawer with mirror looks so gorgeous. Well done! the furniture looks wonderful in the room. the color scheme is charming! Every picture is incredibly realistic!